E-mu SP-1200 drum machine, Gorilla Solar Studio. Gorilla Solar Studio is a fully off-grid solar-powered recording studio. 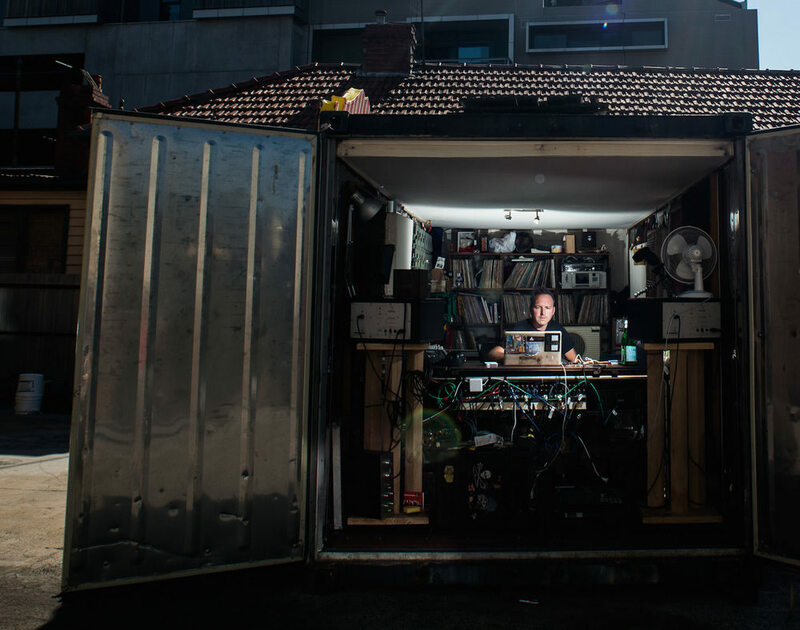 Built in a converted shipping container, the studio is powered by a solar- and wind-powered trailer. Building the solar studio was one of Monkey's long-time dreams. He has been a strong believer in alternative energy since the late 1990s, and spent many years travelling around Australia in his vegetable oil-powered van with MC Izzy Brown and the Labrats Solar Sound System. 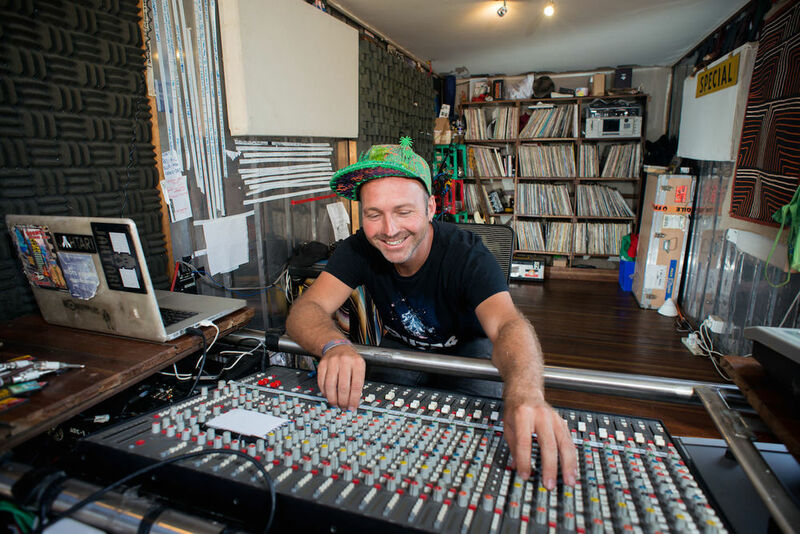 After recording his first official release in the Labrats solar caravan in the Australian desert, he pooled together his resources and knowledge and built a fully self-contained and self-powered recording studio in early 2009. The aim of the recording studio is to have close to zero environmental impact. It was built mainly with recycled materials: a basketball court for the flooring and tables, a vintage BBC recording console and classic electronic music equipment for production. The studio is fully transportable. 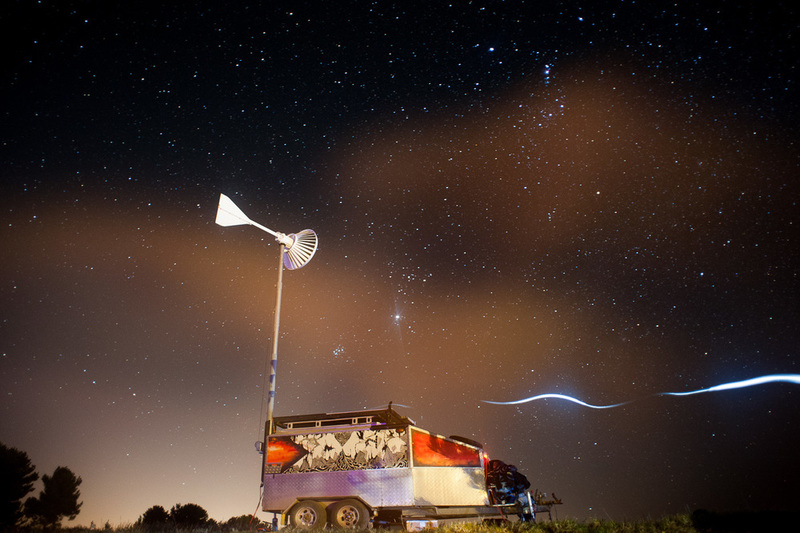 The solar- and wind-powered trailer is fitted with an array of solar panels, a wind generator and batteries. The trailer provides around 1500 watts of power by storing energy harvested from the sun and wind into a large 24 volt battery set-up housed inside the trailer. It is able to power the studio around five days of the week. The trailer is also used to power the solar-powered sound system. The studio is available for hire on a project by project basis. Dubplate recording session with YT, Adrians Wall and Rogue Magnetic. Photo: Francesco Vicenzi. Calrec analog mixer and MPC. Photo: Francesco Vicenzi. Dubplate recording session with YT. Photo: Francesco Vicenzi. Monkey Marc. Photo: Francesco Vicenzi. Gorilla Solar Studio, Melbourne. Photo: Francesco Vicenzi. Monkey Marc's solar and wind powered trailer. Photo: Francesco Vicenzi. Monkey Marc and YT in session. Photo: Francesco Vicenzi. 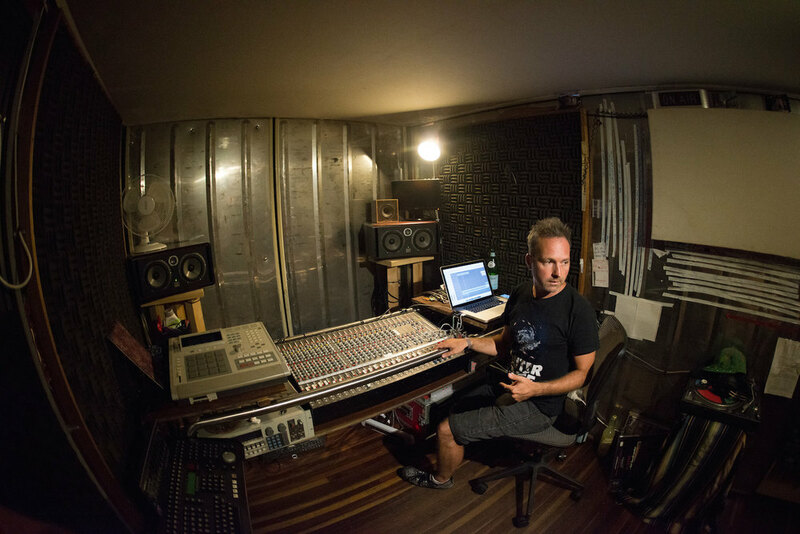 This 2011 interview with Monkey Marc by Bindarri magazine discusses the solar studio set up, the solar trailer and the development of the solar sound system. Monkey also talks about his passion for social change and his work on remote indigenous community projects. Bindarri is an online magazine focusing on Australian creatives who are working for positive social and environmental change. Monkey Marc, Richard Allen, Phil Boutle, DIY Hi Fi Sound System. Monkey Marc is a co-founder of one of Australia’s largest solar and wind-powered sound systems. It is a fully off-grid, full range sound system, designed to produce the best sound for the least power. In an era where global warming is a major issue for the planet and fossil fuels rule the roost, DIY Hi Fi saw an important need to provide an alternative energy-based sound system. Partying and celebrating only by using the power of the wind and the sun sounds and feels better. Monkey Marc's solar and wind-powered trailer powers the entire sound system. Both are available for hire. DIY Hi Fi Sound System was hand-built by Richard Allen, Monkey Marc and Phil Boutle. The three had many years working with solar sound systems in the past, with Monkey Marc's Labrats Solar Sound System, Richard Allen's Magic Solar Playground and Phil Boutle's UK sound system experience, and collaborated to form DIY Hi Fi. Phil Boutle has been a full-time sound engineer for over 20 years, and provides the ideas and sound know-how. Richie Allen provides the engineering expertise to turn the ideas into wooden and metal reality. Monkey Marc provides solar skills and audio knowledge to make sure the system provides maximum bass at all volumes. Solar and wind powered trailer, DIY Hi Fi Sound System. DIY Hi Fi uses uniquely designed speakers providing a clear full-range sound with maximum efficiency. Inspired by Tom Danley's (Danley Sound Labs Ltd) innovative designs, it uses 4 x Unity style horn mid/tops and 4 x SS15 tapped horn subs. Big barn doors on the subs increase the efficiency even more. Full Fat Audio, C-Audio and Behringer Class D / AB SMPS amps offer the best output vs power ratio, and of course, sound quality. The sound system has played at festivals such as Rainbow Serpent and Let Them Eat Cake. It has also travelled and played in remote areas such as the Lizards Revenge Festival in the desert, and has featured at many events across Melbourne. The DIY Hi Fi Sound System also regularly follows Monkey Marc and Combat Wombat shows to provide the sound. Solar and wind-powered trailer. Photo: Francesco Vicenzi. DIY Hi Fi Sound System - 100% hand built. 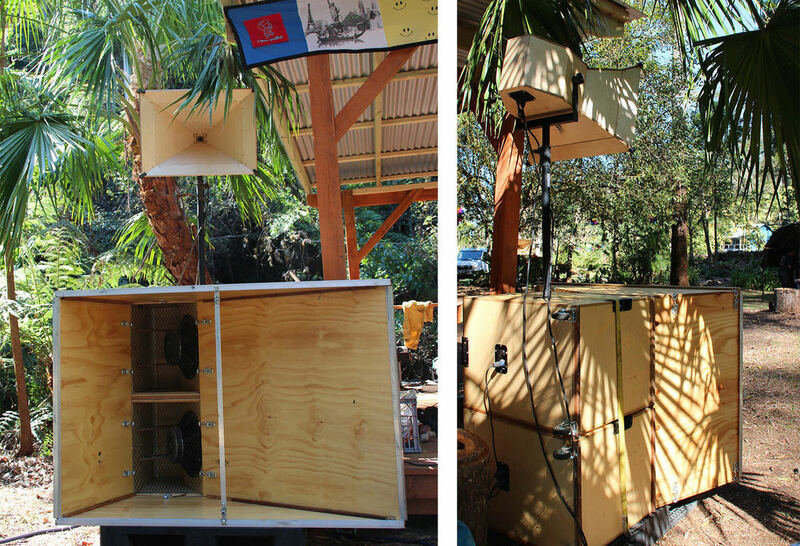 DIY Hi Fi Sound System at Anita Holiday, Bellingen, NSW. 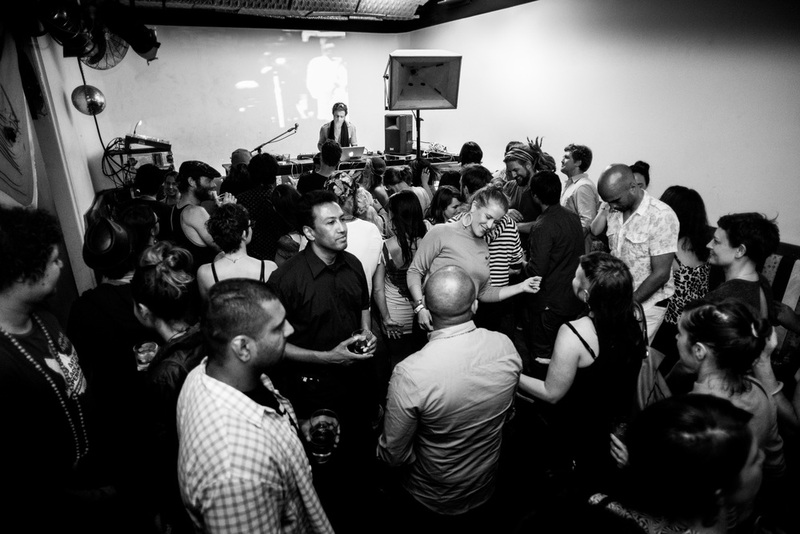 Free party in Melbourne. Photo: Francesco Vicenzi. DIY Hi Fi Sound System at Horse Bazaar, Melbourne. Photo: Francesco Vicenzi.